The Explorer is the original crossover and in case you are not aware, it was once the best selling one in the World. So, what changed? The time changed and the car is no longer at the top of the charts. Before you shut this off, the fact still remain that it is still one of the better offerings on the market which has a really nice blend in terms of space, performance, and affordability. Although there’s no official release date yet, based on the knowledge of previous years, it is safe to believe that the 2019 Ford Explorer will arrive in the fall of 2018. Be on the lookout for the news. 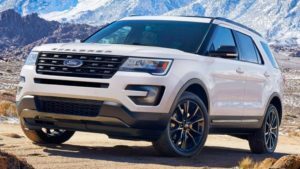 Including the destination fees, we can conveniently expect that the official pricing of the 2019 Ford Explorer should be between $32,985 and $54,935. Don’t expect a lot of big changes in the physical appearance of the 2019 Ford Explorer. Nonetheless, it will be larger and more efficient compared to previous models. Some of the new changes you can expect are the colours, packages that come with it, a few changes in the wheels, just to keep things new and interesting. None of these have been officially confirmed. Without the full details, it is easy to take it based on teasers that the new Explorer will come with a smooth front fascia, and gentle curves will be characteristic for the new model. The hood is relatively short whereas a raked windscreen indicates a sloping roof. There are other exciting features of the model which include a roof rack and an upward sweeping beltline. Also, based on the teaser we can conclude that the car will have an upright tailgate. We also expect the 2019 Explorer’s powertrain options to remain the same. This means the base engine should continue to be a 3.5-liter V6 with 290 horsepower and 255 pound-feet of torque, while the optional powerplant is a 2.0-liter turbocharged four-cylinder with 280 hp and 310 lb-ft of torque. For a little more pep, Ford offers the Explorer Sport and Platinum with a twin-turbo 3.5-liter V6 that cranks out 365 hp and 350 lb-ft of torque. As expected, all versions of the Explorer may continue to come with a six-speed automatic transmission. 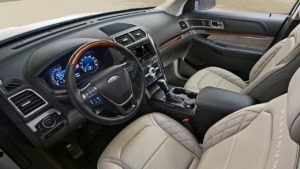 The same thing, little or no changes at all, can also be expected for the inside of the cabin, as the 2019 Explorer should be virtually indistinguishable from the 2018 model. Like the exterior, we could see a few small updates to its features, like new infotainment options, updated colors, and different materials, but none of this will probably be noticeable to the typical car shopper. 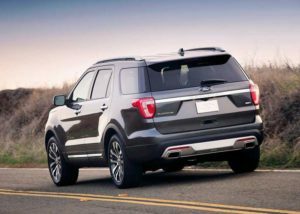 So, it can be exciting to see the 2019 model of the Ford Explorer, but perhaps, not so fantastic changes.